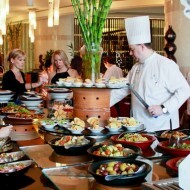 The restaurant is located at the Siam Kempinski Hotel Bangkok. It is the sister restaurant of the Kiin Kiin (“กินกิน” from the Thai word meaning “eat eat”) in Copenhagen. Having been opened for about a year, I’ve heard many positive and also negative things about this place. It’s been the talk of the town. Also being a Thai Michelin stared restaurant from a foreign country got all my attention. I had to check this place out, to see for myself what everyone is talking about. Click and drag on the image to change perspective. Click to view fullscreen. 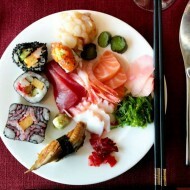 For dinner the menu provides two choices the full set (2,400) or the small set (1,800). The small set is about one third of the full. We tried both; the full set is more fun. I would recommend the full set to get the full experience. 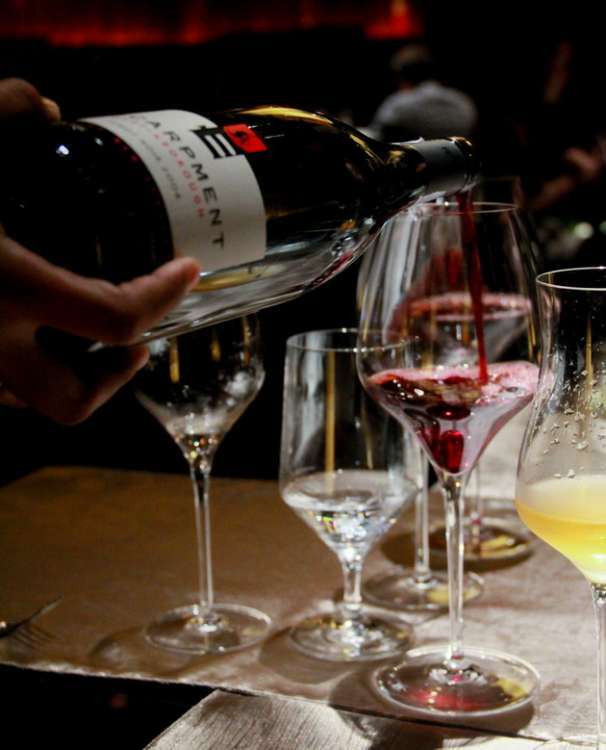 There is wine pairing (2,400), five wines to go with the full set and also juice pairing (950). Creative juices is a very interesting concept, this is the first place I’ve seen juices paired with food. 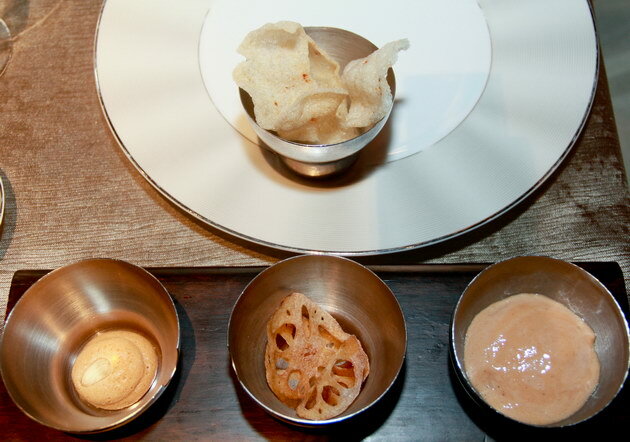 The dinner started with the “Nibblings”, a playful set of snacks – soy meringue roasted cashew, kaffir lime leaf scented lotus root, prawn crackers with chili tomatoes sauce. 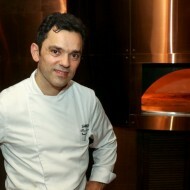 Followed by a set of what Sra Bua calls “The Street Cooking”. Miang Som-O served by the representative chef from Kiin Kiin. 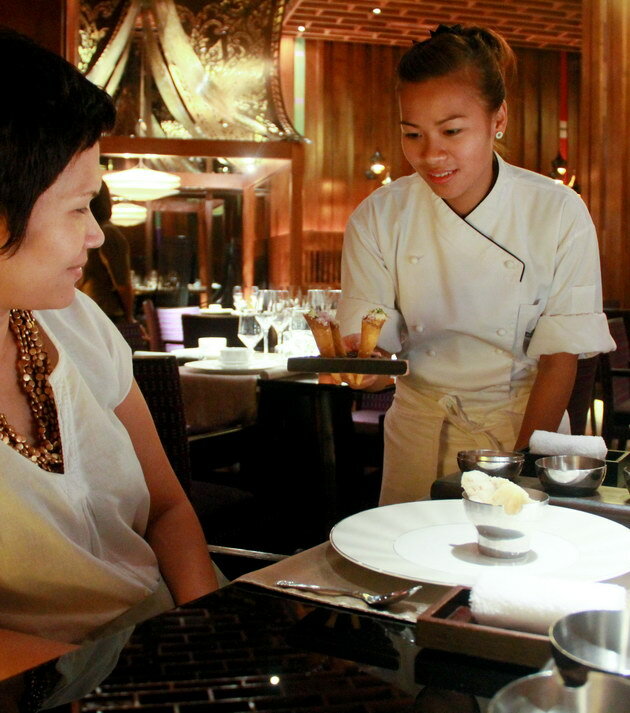 She is the student of Chef Henrik Yde-Andersen the originator of this restaurant concept. A Thai native brought up in Denmark. Along with it was Tuna tartar with peanut cookies. 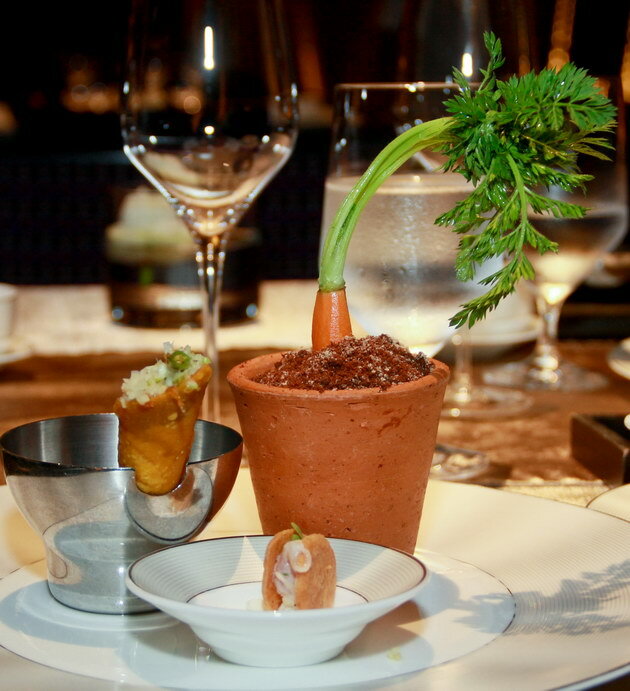 My favorite was “the harvest”, the dish was very deceptive served on a clay pot with a carrot. What seemed like soil was cookie crumbs, underneath was custard like form. I didn’t know it was green curry until I tasted it. Then it keeps coming…. 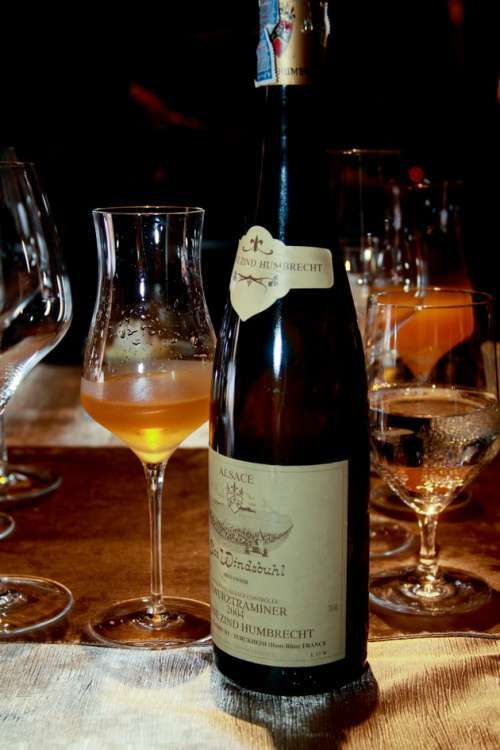 more surprises for the eyes and the palate. 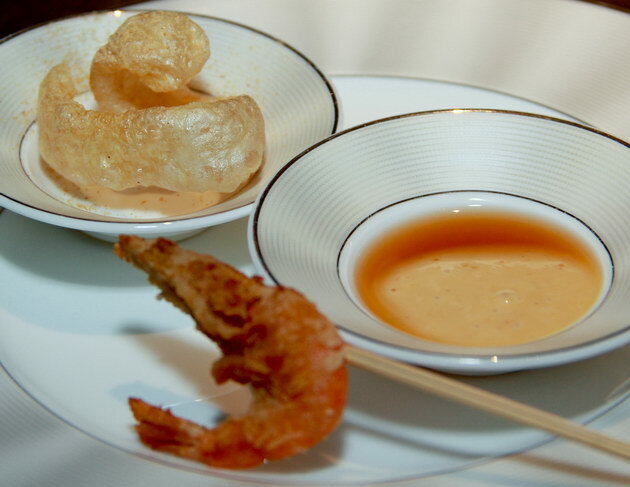 Deep fried shrimp with miso dip and crispy pork skin with curry powder. 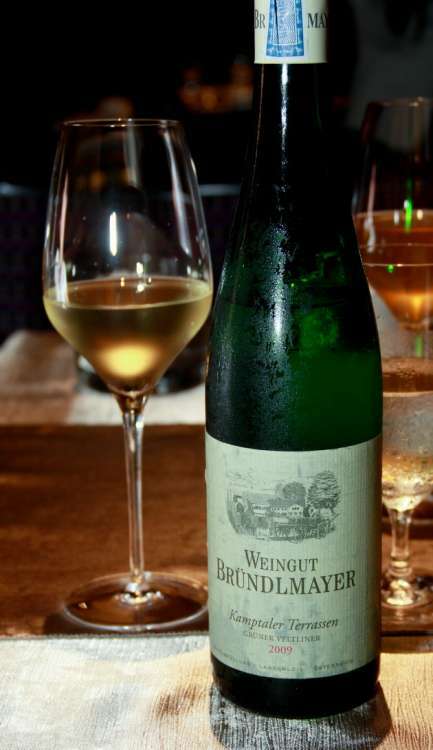 The first wine was served with this, a Gruner Vetliner Brundlmayer Austria a strong fruity wine. The juice paired with this was white flower Ice tea. 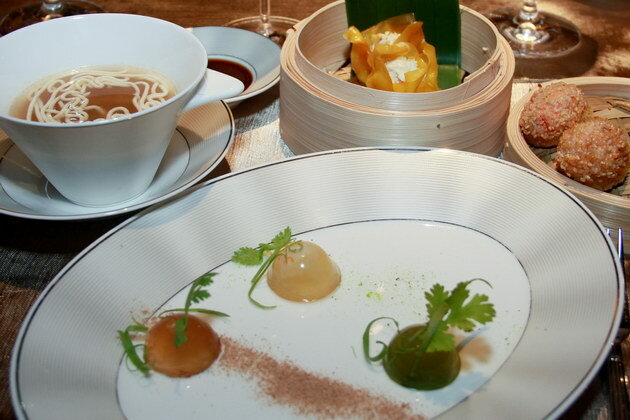 For the mains; it starts with Gelatin and Tom Yum Soup. 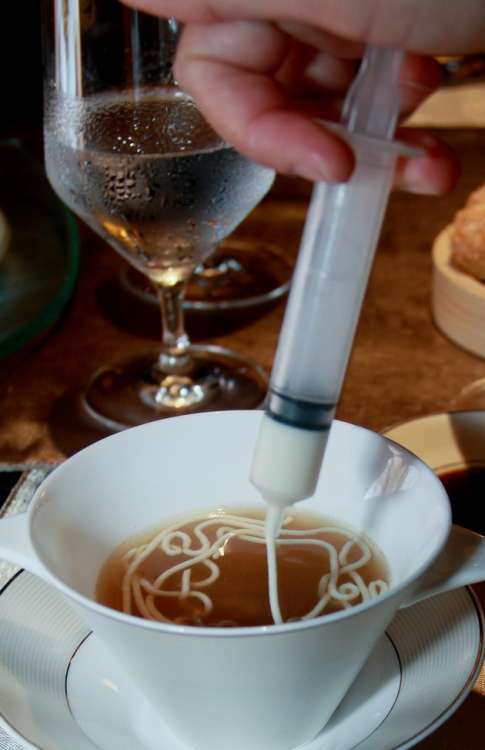 Presented at the table a syringe full with noodle, the noodle set in the hot soup. 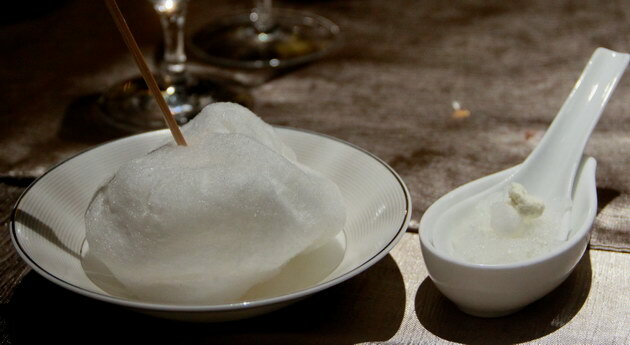 Each gelatin has different flavors that combines to the popular Thai Tom Yum. We were instructed to have gelatin in the mouth then followed by the soup. Each gelatin makes a slight difference in the flavor of the soup, the green one is cilantro, the white one is shrimp and the brown one is galangal. 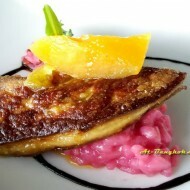 Frozen pulp of pomelo spicy salad with grilled fish and warm yum sauce. Grilled shrimp with frozen satay ice cream sauce and coconut pearl.The wine served with the first mains was Riesling Fritz Haag Germany. The juice serve with it was Ginger soda. Frozen red curry and lobster is the signature dish here. 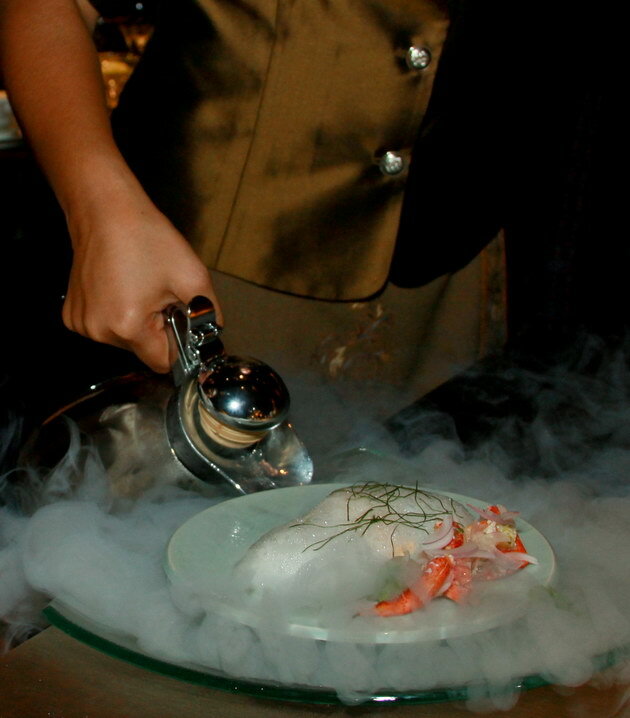 The liquid nitrogen makes the dish chilled to prevent the red curry ice cream from melting. I never thought I would enjoy cold curry this much. 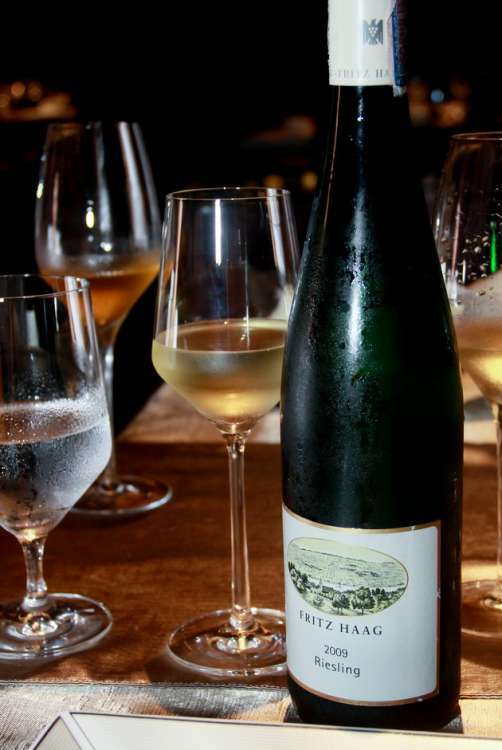 The wine paired with it was Gewurztraminer Clos Windsbuhl Zind Humbrecht France a real delicate wine. 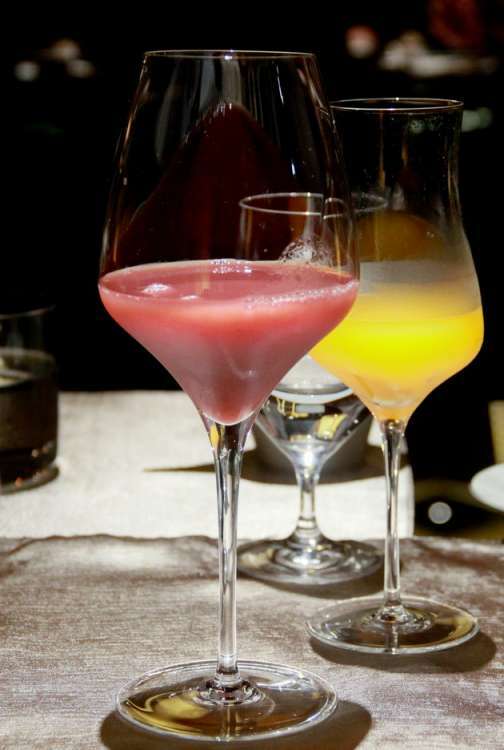 The paired juice was a sweet and refreshing Passion fruit with Lychee. 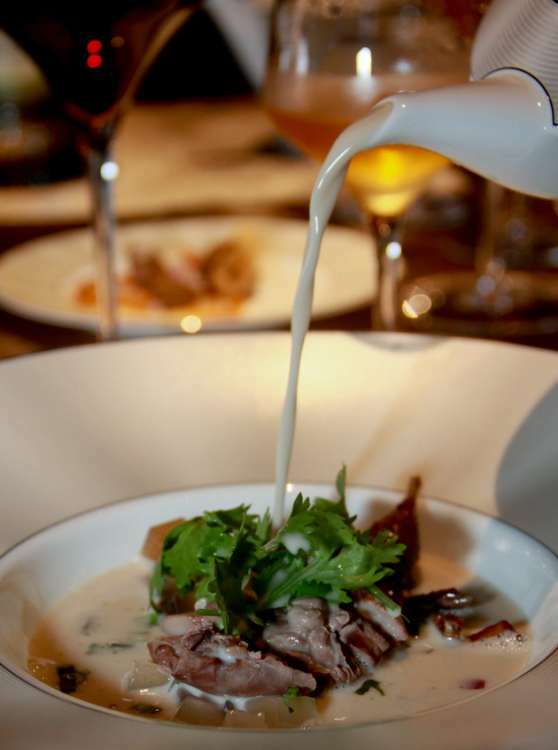 Another popular Thai dish, Tom Kha soup but with quail instead of chicken serve with rice. You can also choose fish. 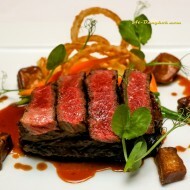 It was served with Pinot Noir Escarpment Martinborough New Zealand a real fine wine. All the paired juices is not just any juice it has been through a lot of thought process. 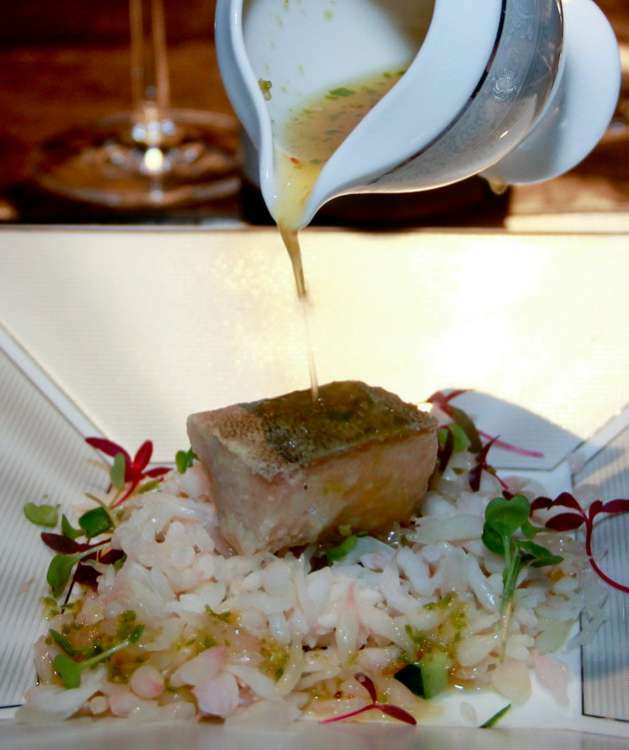 For example the red grape juice serve with this dish had certain body and rare grape taste. 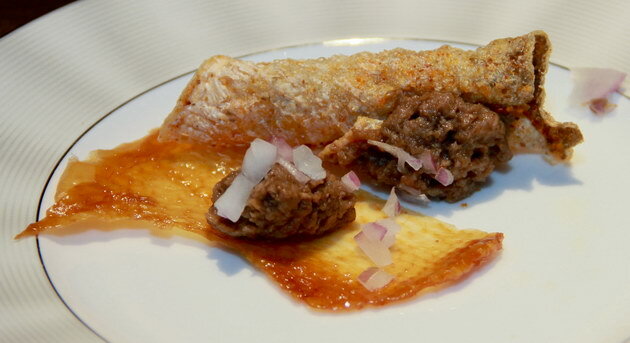 A side dish which was not in the menu, crispy chicken skin and fish skin with nam prik long rue. There were three desserts. “I tim saparod” pineapple, ginger, and lime ice cream a refreshing palate cleanser. 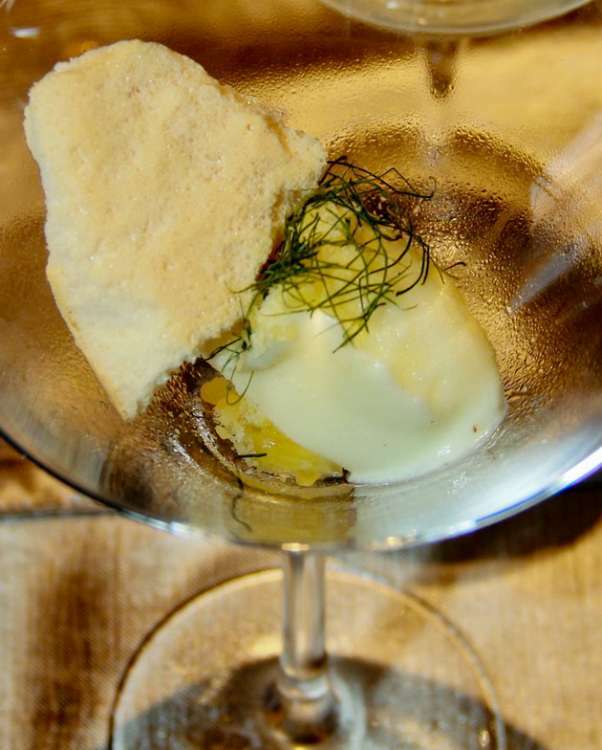 Vanilla ice cream with 5 spice orange cake and passion fruit foam. The rich vanilla ice cream was complimented by a tangy orange cake. 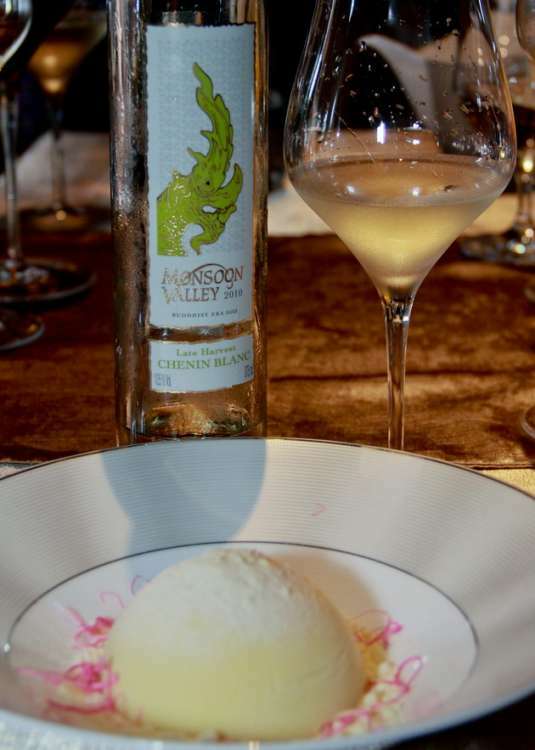 The desserts were served with a Thai sweet wine Chenin Blanc Monsoon Vallet Thailand. My favorite was pistachio cake with pandan icecream coconut foam. 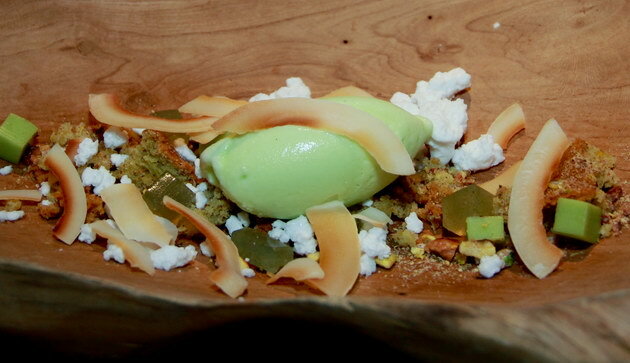 The scent of the creamy pandan ice cream accompanied with pistachio cake crumbs, pandan jello, roasted coconut chips and a cheese like coconut foam was irresistible. 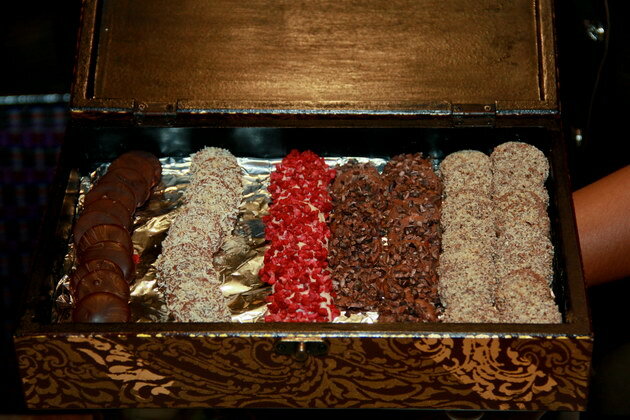 Although these are not really Thai desserts, they are all delicious. 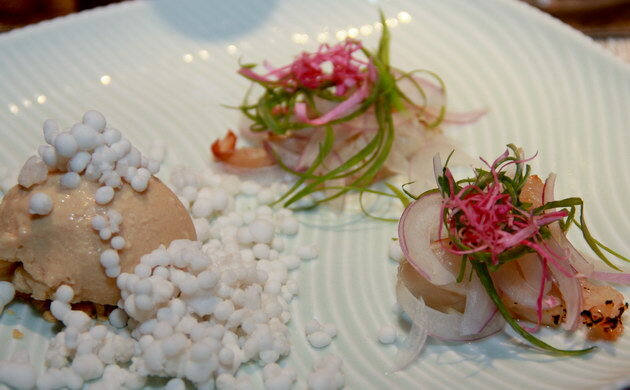 I’m not sure what to call this type of food weather molecular or/and deconstruction of Thai food. 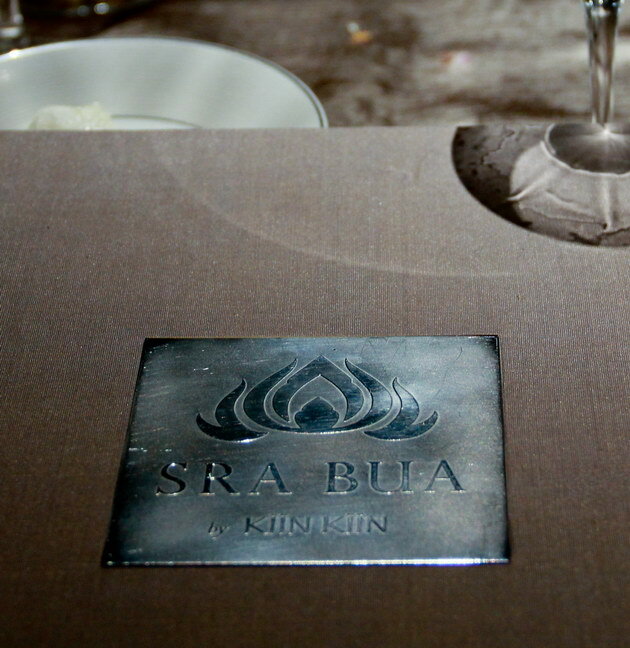 What I know is, Sra Bua by Kiin Kiin is simply very creative with its food specially the presentation. 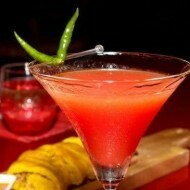 This place is truly a great dining experience for people who is open minded and knows Thai food. 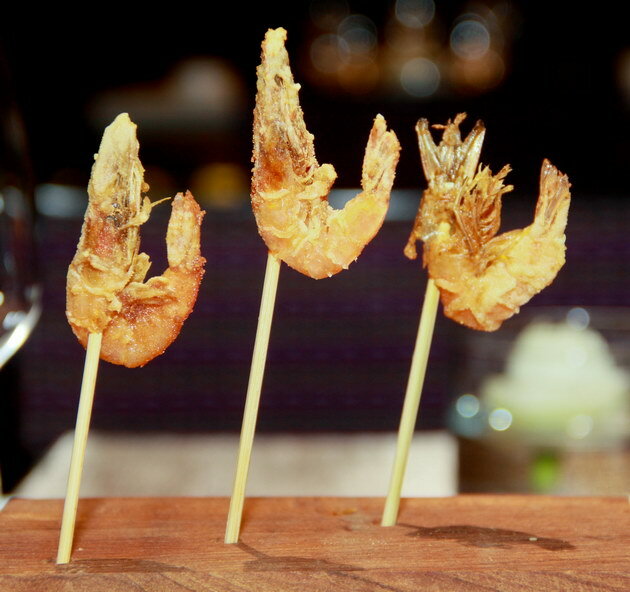 If you don’t know Thai food, you will not be surprised. It is above and beyond my expectation. 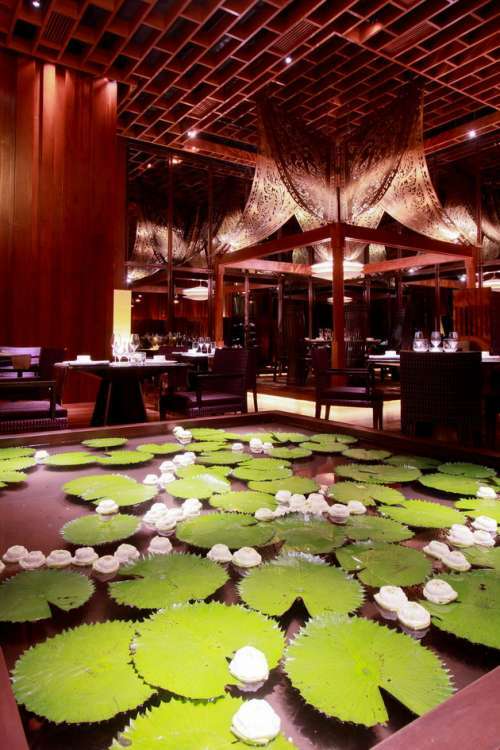 A combination of great ambiance, superb service and of course delightful interpretation of Thai food made it marvelous. 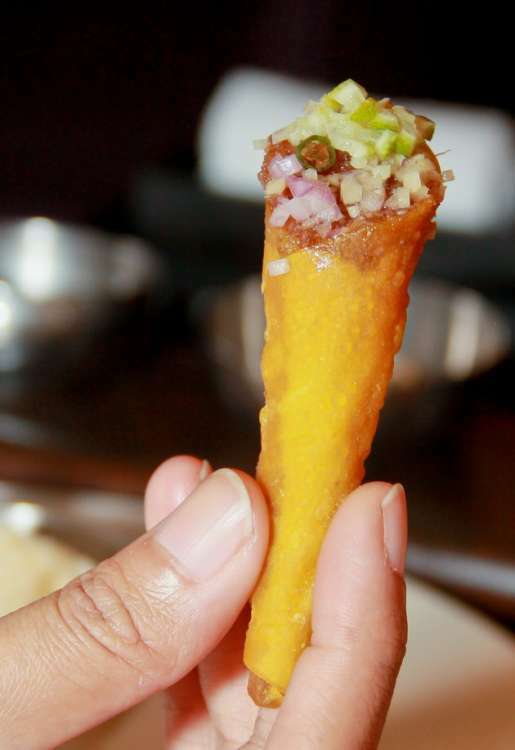 This place will give you a totally new perspective on Thai food.